Explore stunning glaciers and towering fjords on a cruise to Norway and Scandinavia! Discover some of the world’s most spectacular natural landscapes on board a cruise to northern Europe. Marvel at Norway’s majestic fjords, indulge in the warmth of Iceland’s thermal springs or gaze upon the rugged Arctic landscape of northern Sweden. Learn the secret to "hygge," the Scandinavian concept of coziness that's sweeping the world. Experience the curious midnight sun, or witness the incredible phenomenon of the Northern Lights. A cruise to Scandinavia is for the adventurous traveler looking for a once-in-a-lifetime experience. The high season for a cruise to Scandinavia runs from May to September, where the summer sun makes for smooth sailings and mild weather. Summer is also high season for wildlife viewing. Expect to get up close and personal with reindeer, elk and Arctic foxes during shore excursions, and watch the whales come astonishingly close to the ship. If you're lucky, you may even see a polar bear hunting among the glaciers. Bergen, also known as the ‘City of the Seven Mountains’, is situated on Norway’s southwestern coast. Nestled between the Hardangerfjord and Sognefjord, the ancient Viking city is the gateway to Norway’s majestic fjord region. 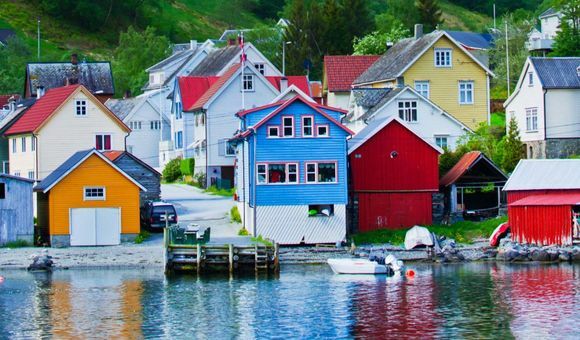 Once the epicenter of the Hanseatic Empire, Bergen lures visitors with its historic fishing culture, charming old wharf, colorful Hanseatic architecture, world-class hiking trails and buzzing nightlife. Reykjavik is the capital and largest city of Iceland. Considered as one of the cleanest, greenest and safest cities in the world, Iceland welcomes visitors with a unique beauty characterized by its proximity to the arctic circle. Reykjavik’s Vatnajökull National Park offers visitor a formidable experience with its stunning glaciers and natural ice caves. The charming coastal town of Stavanger is situated on Norway’s southwestern coast and is best known as the gateway to the magnificent Lysefjorden and Pulpit Rock. A popular summer destination in northern Europe, Stavanger offers a unique combination of adrenaline-packed outdoor attractions, centuries-old architectural heritage, and delectable culinary experiences. Flåm is a small Norwegian village located near the Sognefjord, with an approximate population of 450. Flåm is located at the innermost part of the Aurlandsfjord. Flåm has become somewhat renowned due to the location of the village amongst mountains and the fjords. The Flam Railway has been rated amongst one of the most scenic rail journeys in the world and offers a fascinating mountain landscape in addition to thundering waterfalls The nearby Stegastein viewpoint is another is a popular tourist stop and offers unrivalled scenery of the fjords. .
Oslo, also known as the green city, is home to countless attractions and has an enchanting Scandinavian flair. Some of the attractions include, the royal palace, government buildings, the Storting parliament building as well as the town hall, where each year the Nobel Prize is awarded. For gift shopping, head over to the shopping street of Karl Johans Gate. You are sure to enjoy your stay here as Norwegian people are very open and friendly. Akureyri is a city with an approximate population of 18,000, located in northern Iceland. The city is known for having a stunning natural landscape, which means that there are many opportunities to enjoy outdoor activities. One of the most unique opportunities which can be enjoyed in Akureyri is the chance to witness the Northern Lights between September and April. Akureyri is located at the base of the Eyjafjordur, another example of the stunning natural surroundings. Geiranger is a charming village in western Norway nestled at the foot of the magnificent Geirangerfjord. A hugely popular cruise destination, the tiny UNESCO World Heritage Listed village welcomes more than 600,000 visitors annually, lured by some of the world’s most spectacular natural wonders such as The Seven Sisters waterfalls, Eagle Bend and historic mountain farms of Knivsflåal. Honningsvåg is a charming little fishing village situated in Norway’s far north, just 1304 miles away from the North Pole. During the summer months, the city attracts visitors from around the world to experience the famous Midnight Sun. Just a short drive from Honningsvåg is the staggering North Cape, the northernmost point of Europe and the border of the Arctic Circle. Known as the ‘Gateway to the Arctic’, Tromsø is the largest city in Norway’s remote north. Located just 217 miles south of the Arctic Circle, it is one of Northern Europe’s top year-round cruise destinations. From September to March visitors flock to Tromsø to witness the mind-blowing northern lights, whilst during the summer months, the city becomes alive with round-the-clock events celebrating the midnight sun. The capital of the Faroe Islands lies on the east coast of the largest island, Streymoy. With its major trade and ferry port, Tórshavn is the economic and political center of the country. The city is home to over 17,000 inhabitants. Be sure to explore the narrow streets of the Tinganes Peninsula, the oldest part of town. The cathedral and the lighthouse at Thorshavner Skansin Fort are worth a visit. Trondheim is Norway's third largest city. You can find significant cultural and historical sights such as the Nidaros Cathedral and Archbishop's Palace here. You will also find the residence of the Norwegian King's, one of the most important traditional wooden buildings in Scandinavia.